This post will have all the information needed to get the Frsky telemetry data tx module mounted on your Turnigy 9x transmitter (backorder it or you may never receive one!!) and data displayed on your Android device. I'm still waiting for some parts so I can't post all information yet. Get back this post if you need all the info. First step is to get this module on your Turnigy 9x and confirm the normal radio functions are still live once done. I got all the needed information from this topic on rcgroups. The biggest issue is that you need to cut the original antenna since Turnigy didn't respect the modular system. Luckily only this is the only issue. Some pictures from that thread. What this person did was unsolder the wire on the module so you can take wire through existing holes out of the transmitter and remove antenna. If you want to reuse the turnigy module or want to keep it as a backup you'll then have to solder the antenna again to the module. This soldering isn't easy!! I checked the size of the soldering to be done and decided I wouldn't take that risk (not with my skills). So I created a bigger opening next to each opening for the wire. For the antenna to pass through you need a 9mm hole. Be very careful not to damage the antenna!! I protected the antenna with some duct tape first. Better safe than sorry. You need to create this opening in the back board and in the back plate of the module. For mounting I also created a hole in the front (sticker) of the module to put the new antenna on. 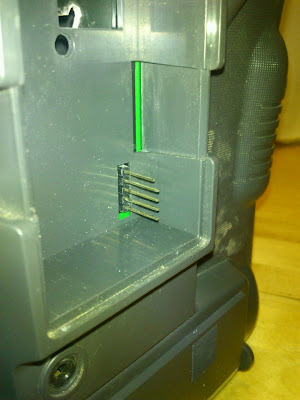 Once you have a 9mm opening next to the smaller holes you can connect these and so the antenna and wire are free to go through. 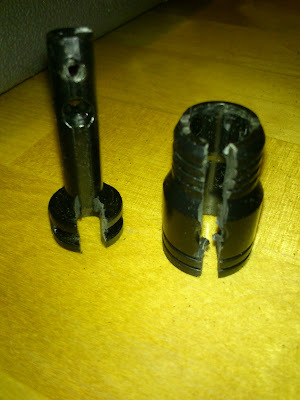 This is how the antenna looks once you have the screw on the antenna bracket and inside the casing undone. 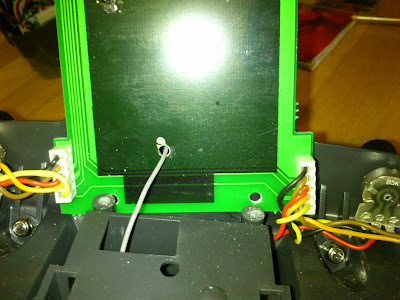 The 2 black plastic parts need to be removed and then you can get the antenna through without touching the wire. The 2 black pieces on the bottom of the antenna that had to be cut to let wire through. 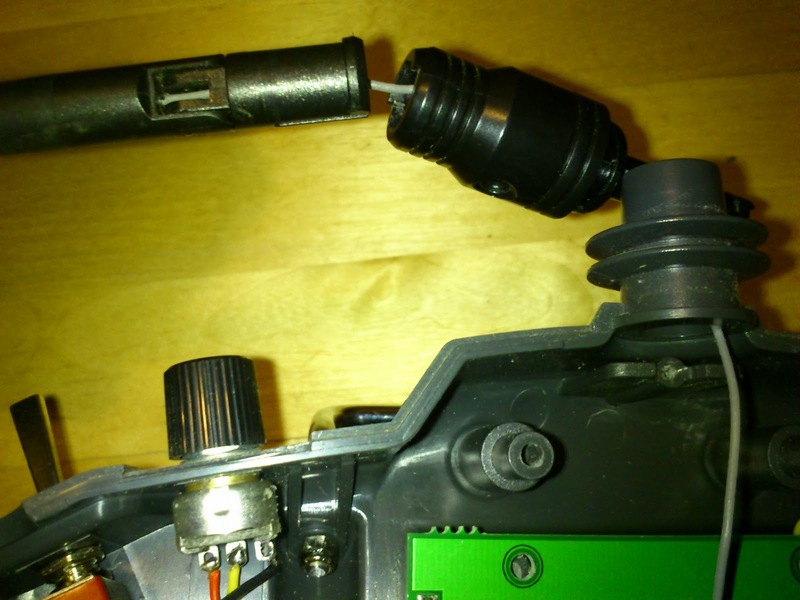 Now the antenna is free to go through the antenna foot of the casing. 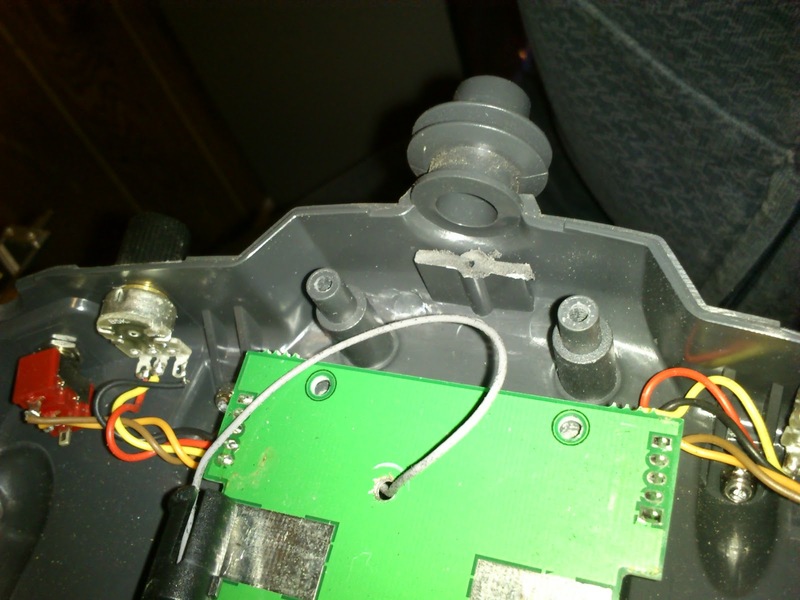 You can see I also had to cut a bit of the plate on the casing where the antenna foot screw was attached to. It can still be used, it's just a bit shorter now. 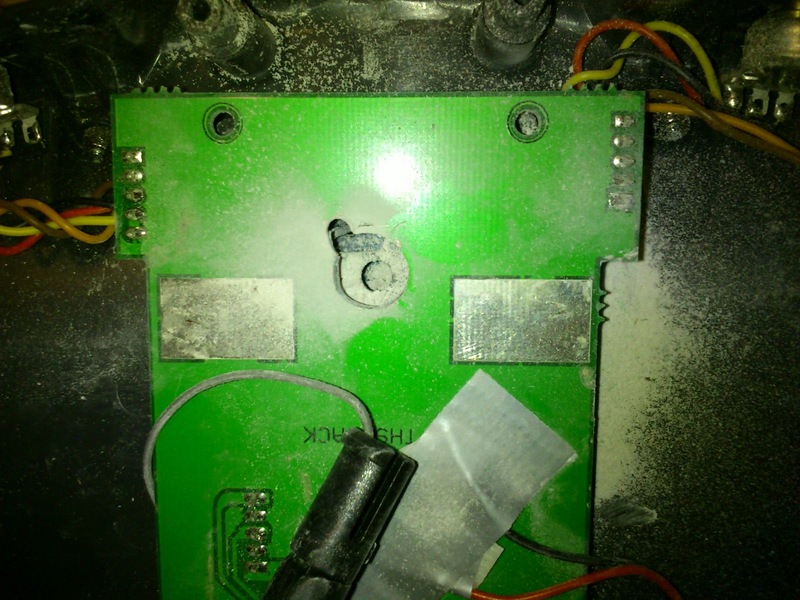 This is how the antenna wire comes through the back pcb. On the back this pcb is painted darker (black) and you can see some tracks on the borders. Stay away from these tracks. 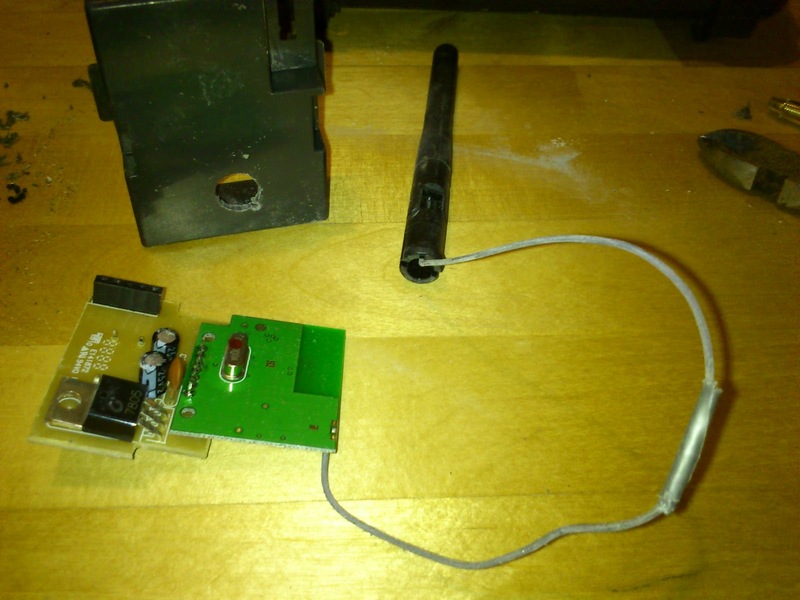 By simply cutting a 9mm hole next to the smaller antenna hole and then matching these you can get the antenna in one piece through this pcb also. When cutting the pcb you have to be very careful not to touch the antenna wire! I had the antenna wire wrapped in some tape and used a dremel tool to get the 9mm hole cut out. The same 9mm hole was made in the module casing in the back. The transmitter casing already had a hole that lets the antenna pass. Here you can see the protective tape. The final assembly. I hot glued the antenna in place. Now you're ready to plug in the frsky DJT module. In fact all you need to do is swap the module on the back. Make sure you ordered the DJT and not the DFT module. 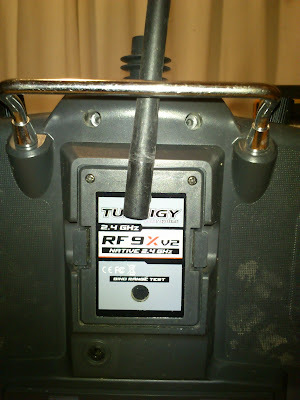 The DJT module is for JR type connections (like the turnigy 9x) while the DFT is for Futaba & Hitec type connections. Hobbyking has some errors in the names of their products. Check these links to make sure you have the right one. It should be just a matter of swapping the modules around. Test your connections though since I had some issues with mine. On my Turnigy 9x the PPM pin (the top pin) is a bit shorter and was not connecting well on the frsky module. Bad thing is that you don't get any real feedback from this issue. The longer power pins are still in place and connections with receiver is OK. The only thing missing is the PPM value... so no servo's or throttle will react!? I could easily have the pins disconnect by just shaking my transmitter!! The top PPM signal pin is shorter than the other pins! I read about other people having issues with their original module because of the pins on the tx casing side being pushed back. Mine were strongly in place on the tx though. So next I opened up the frsky module and tested again with the module cover taken away and I noticed the pcb in the module was pushed back! 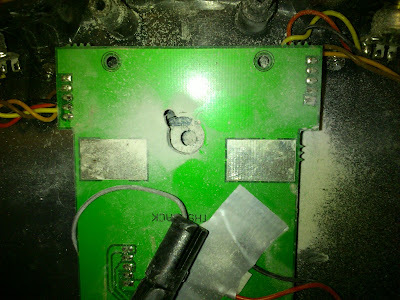 Fixing this with some hot glue to keep the pcb in place was my solution. In the end this turned out to be a QC issue. The pin was just pushed back on the soldering so I could easily fix this by heating op solderjoint and pushing from the other side back out. The white piece accepts the pins. I dropped some hot glue above and underneath that connector on the pcb agains the wall of the housing. This way it can't come up anymore. Now let's hope I never loose control up in the air. Or even worse on takeoff or landing. Once up I could probably still realize that the module got out and just push it back in. But on critical moments I'll definitely crash my plane! 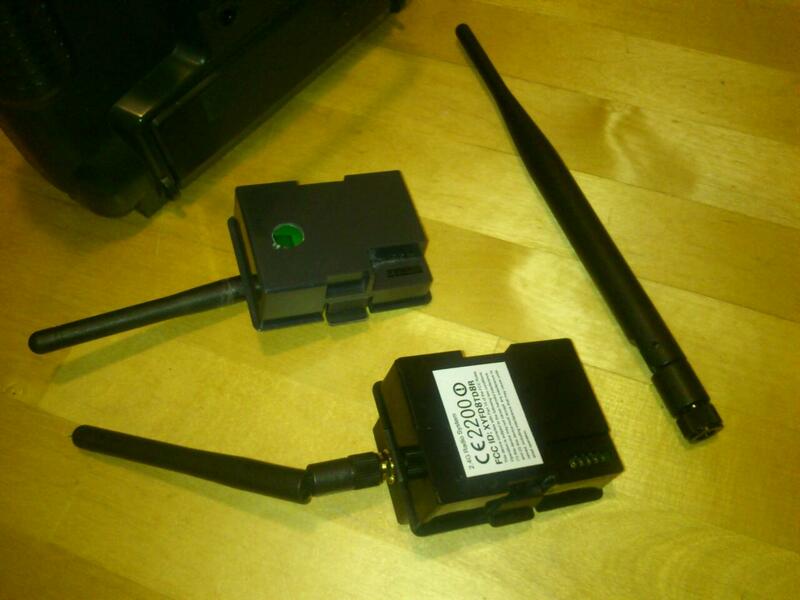 Next we want a wireless communication set up between our android device and the Frsky DJT telemetry system. For this we will use bluetooth since it's so cheap and easy to use. Some people were concerned that the 2.4Ghz of the bluetooth would interfere with the frsky signal. I didn't notice any issues for normal flying. Can 't say what it does in longer range situations like FPV. No need to worry until you get an early bad signal feedback from your module. At that point you can always start testing with a wired connection between your android device (usb serial) and the module. All the information you need to connect these elements is available here. You basically want to connect the power and ground on that bluetooth board and have tx connected to rx and vice versa. 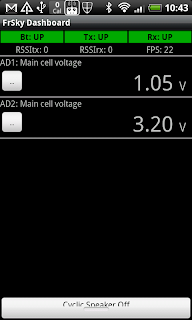 Make sure to check voltage on pin and what voltage your bluetooth connector accepts. 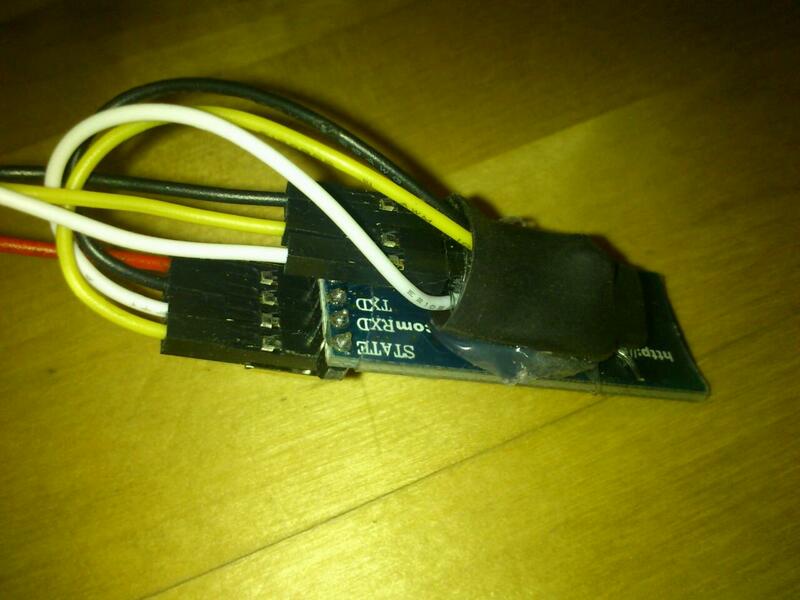 This is a picture from the module used in the project linked on top. 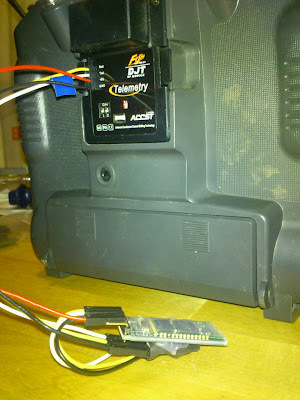 It should work without any modifications directly to the pins on the frsky module. At least that is what I understand from the documentation. I used a cheaper bluetooth module from goodluckbuy. More information on the bluetooth module I used (from goodluckbuy.com). Besides the normal settings update I also had to add a serial inverter in line. Otherwise I got a bad signal that the android dash couldn't parse any data. 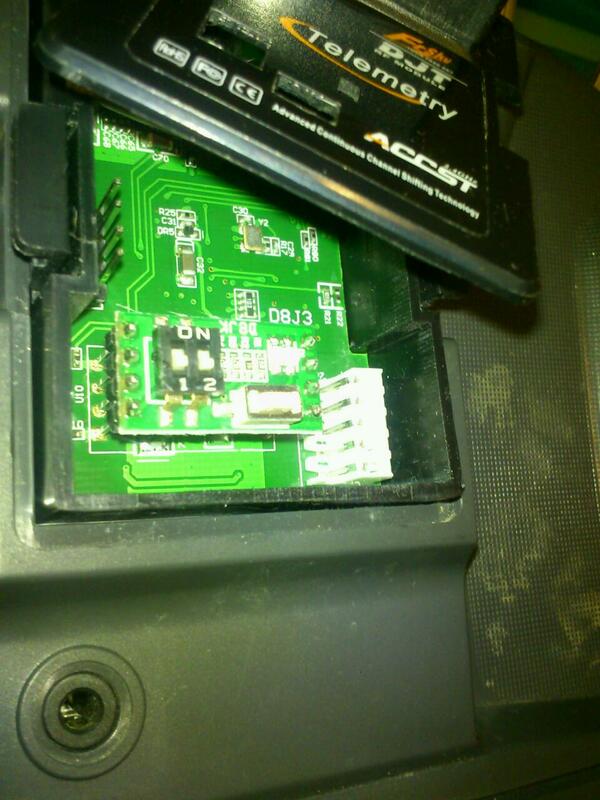 To fix this easiest solution is to add the inverter from frsky. Known as the fdl-lite or the upgrade cable lite. The extra inverter board wrapped in black shrink and glued to the BT module. If you check the output by connecting your android using BlueTerm app and you see strange characters you probably have the baud rate set wrong. This step is easier than you could ever imagine. An apk is already written and available. Project information is available from this frsky android dashboard project website. For now the application is only listing the analog voltages and signal strength. You can also set the alarms using this app. But I didn't see any support for the sensor hub yet. Project looks very active still so I expect it to be available some day. I already contacted them to see if I can contribute my code I'm going to write for this. I've been working together with the creator of this app to get the sensor hub information on the screen as well. We have all sensors translated properly and a basic visualisation. Next step is to create some better visuals for this data and implement all the nice extra's. Keep an eye on the project website if you're interested! The Android application has many features you can implement. Think of gps position of both plane and Android device on transmitter on map and calculation of distance between them. Graphical and audible information about altitude. Logging of data to sd card in any format. And so on. You could even use twitter to fool around (no real use for that yet but you never know). Keep subscribed to see what can be done!